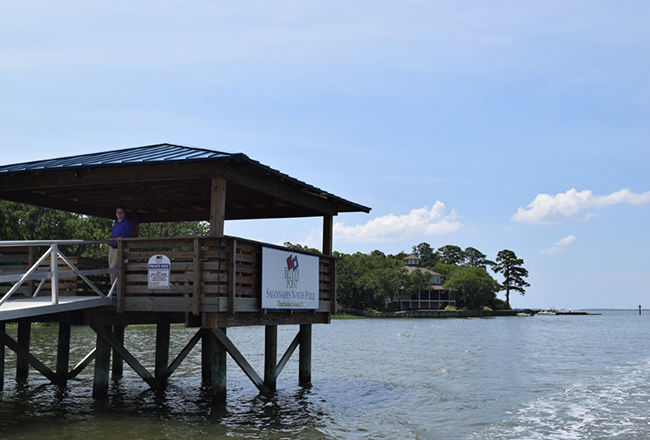 Our boat club day trip went to the southernmost tip of historic Daufuskie Island, South Carolina – Bloody Point. This island is rich in tradition and history, and our particular destination was named after a famous battle between the settlers and native Indians. The island waters ran red with blood during this battle and, ultimately, the Indians lost. A cotton plantation era soon began, and with it, a battle with the boll weevil – which won. After that, oystering began, but it lost to the Savannah River pollution. Residential development then came to the area, as the views and remote destination made it a breathtaking place to settle. It battled bankruptcy… but now it is blossoming again after being purchased in 2011 by entrepreneur florist magnate Brian McCarthy. My seat was on the lead boat with my Resort Girlfriends, family, and Captain Trey. 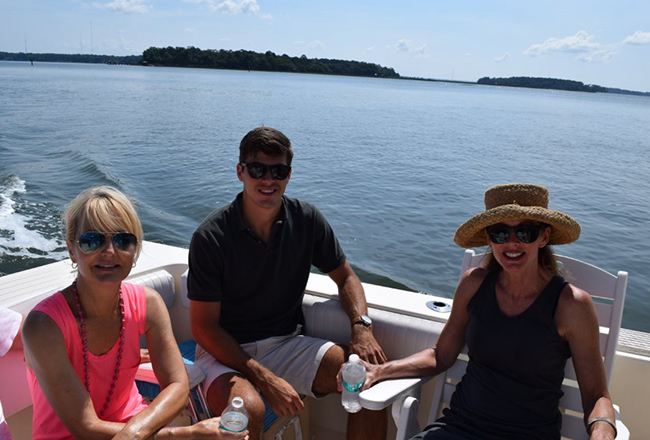 As the 9 boats steered their way into the brand new dock, Mr. McCarthy’s son and staff greeted us on this historic point. Our group was then taken and treated to a cookout of burgers, dogs, coleslaw, Bloody Marys and more at the Bloody Point pool. After dining, some splashed in the pool and others ventured off to the beach. My destination was to walk to the bloody point – and I did. My eyes delighted in the long, expansive ocean view, with very few footprints in the sand. As this destination is reached only by boat, few inhabit the island, making it a perfect day or evening getaway from the hustle and bustle of the public beach spots. There are water taxis to and from the island, so it’s easy to reach. After a glorious day in the sun, our boats pulled out from this historic island. 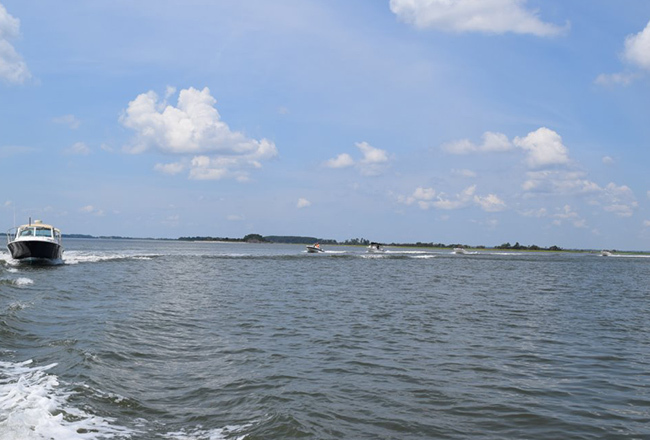 Explore more of Bloody Point and the history of Daufuskie Island. It’s a Resort Girl remote recharging destination. Please let me in! I asked Resort Girl Julia to see her fiancée’s latest luxe resort home. Nathan Cameron is a prominent custom home builder in the Bluffton, S.C. area, and Julia and Nathan kindly agreed to my request for a personal tour. I find such delight in viewing beautiful spaces, including home designs and interiors. This custom home has also been expertly decorated and furnished, adding to my anticipation. Located near the May River, where summer breezes and captivating views are within a RG’s steps, Nathan’s vision was to design a home blending a historic look and a modern vibe (like many restored urban lofts.) 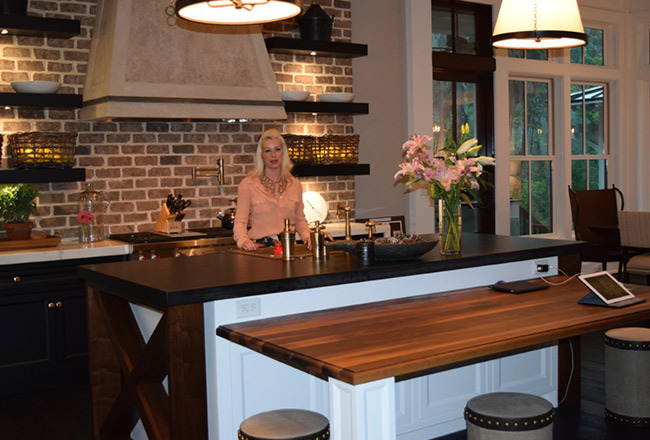 He succeeded in this graceful yet eclectic (and slightly edgy) design on Nottingham in the Barge Landing area of Palmetto Bluff, S.C.
As I was graciously welcomed in, my eyes first set upon the impressive brick kitchen backsplash wall. It surely made a splash, and so did many of the other natural elements of this inviting cooking and entertaining space. There are wide open areas with so many places to sit, relax, chat and enjoy the views from the impressive set of windows. The natural elements used throughout Nathan’s home range from brick to reclaimed wood floors, barn piers and even down to a portal window in the back pantry. Yes, besides a completely spectacular open design kitchen, there is a fully equipped back pantry to keep clean views. Nathan believes in linear design with all edges square and even under cabinet mount outlets. This back pantry is accessed via a dutch door containing a service refrigerator, and all items needed to prep and store a multitude of food, plating and entertaining items. And to top it off, this space opens up to the grill porch for easy pass through of your grilling goodies. Off to explore other areas! The wet bar area is accented with wood and smoky mirrors and, get this… leather wallpaper. I couldn’t help but touch it, it felt and looked so smooth. 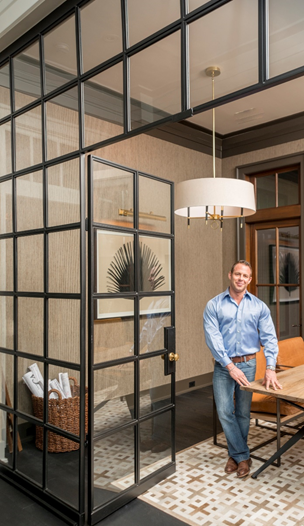 The home office was any writer’s dream with quiet quarters for great ideation time, enclosed by an impressive handcrafted metal wall. 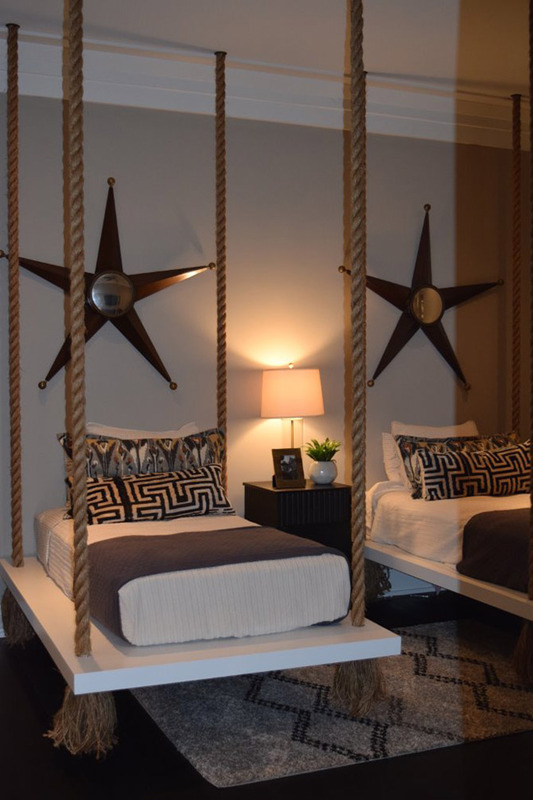 And the guest suites are so inviting with swinging beds in one room. I had to hop on one and experience it! Plus, there’s a playful yet luxe bunk bed room that would have any group of kids eager to escape to. It was even equipped with a built-in TV. In total, the home has (get this) 11 beds. Quite a place for entertaining family and friends for a low country weekend! Next, Julia next took me down to the master suite, and sweet it was. 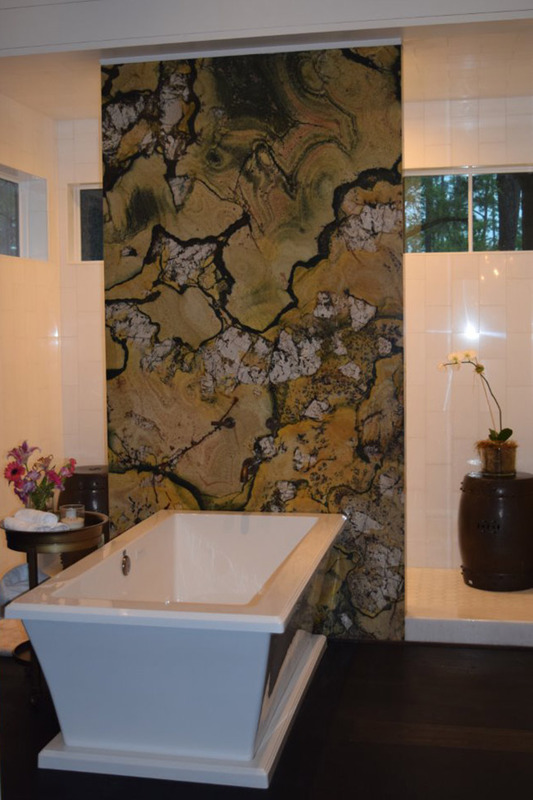 To the right, the master bath has an exquisite wall tile showcasing a made for two (or more) shower designed with open walls, heated floors, and ledge windows creating an open sunny oasis. If an evening of bubbles is what you desire, then the soaking bath with air bubbles is a quiet way to wind down any Resort Girl’s day. Turning to the master bedroom, we passed his and hers closets. We then entered the room surrounded by full-length windows, allowing one to soak in the low country oaks and moss, making for a relaxing day or night. But best of all, the room has what I want to call chillin’ deck door access. This covered porch with a great swing also has an oyster-shelled fireplace with a big screen TV and many comfy seats for family or entertaining. Once on that porch, it was time to see the crystal blue pool, contrasting with flaming fire pits encasing it. There is even a serene cabana for Resort Girl reading or maybe even painting our nails. I am going to have to have Julia and Nathan ask me back to dip into those pleasures, as it was raining cats and dogs that day. However, even with the downpour, it was an inviting, low country experience as listening to rain drops on any porch is sweet music to this RG. This was just a sneak peak at the beautiful home, as there are so many intricate, unique accents and architectural elements to mention. It was a dreamy experience. To find more about this home and many more of Nathan’s dream homes go to Cameron and Cameron. And yes, Nathan has just put this dream home up for sale so maybe this could be your Resort Girl destiny. View more pictures here. 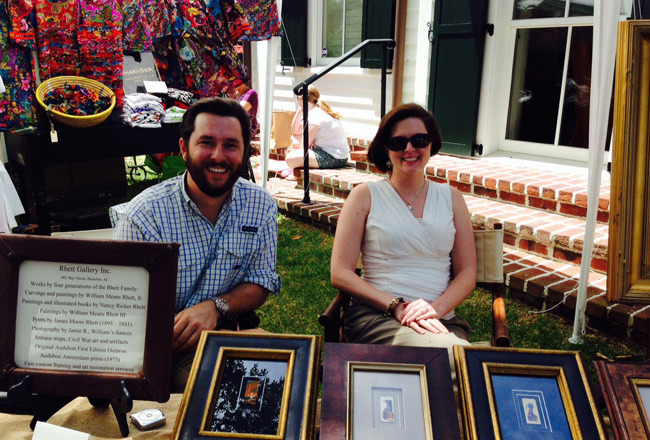 The scene was the new Sunday afternoon art festival at Palmetto Bluff. I was having brunch at Buffalo’s when a painting caught this Resort Girl’s eye. It was propped up in the green grass, against the background of the rippling May River. 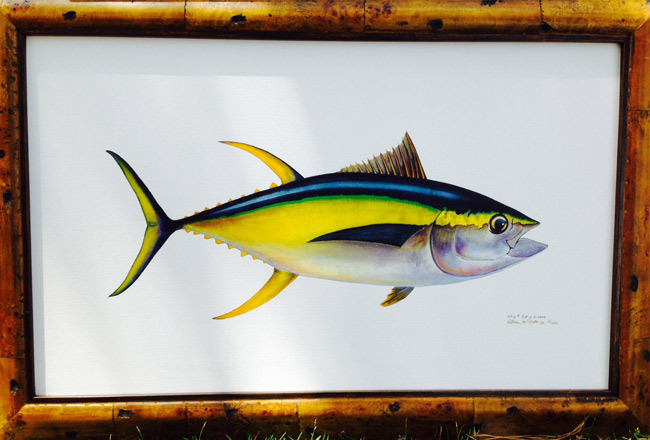 On the canvas was a beautiful blue and yellow fish and, liking clean lines and crisp colors (and fish too! ), I was drawn to the artwork. The artist, William Rhett III, and his fiancée enjoyed the water’s view, which served as a perfect backdrop for their artistry and photography – or what was left of it. It was a successful sales day – especially for his hand-painted antique piano keys. Mr. Rhett and his parents are locals to know in the historic small town of Beaufort, South Carolina, according to a Southern Living article, Small Town We Love: Beaufort, South Carolina. 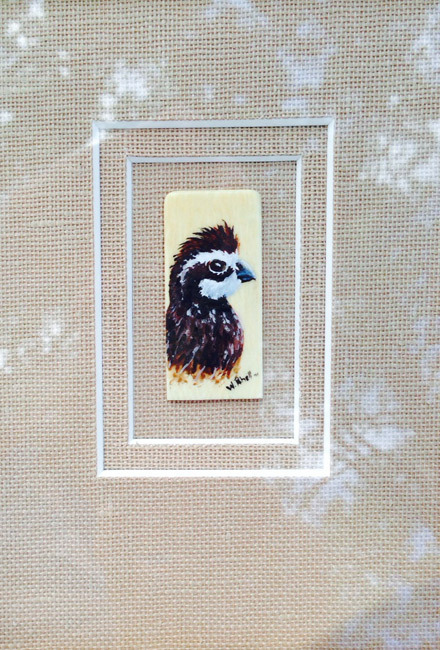 Artist William Rhett III can paint grassy details of a wide marsh scene on the ivory face of a single antique piano key. He can also advise on all sorts of practical local topics. “A johnboat is about all you need around here,” he says. Just 30, William works at his family’s Rhett Gallery (rhettgallery.com) on (901) Bay Street, where you’ll often find him telling stories. Like the one about catching 67 crabs in just 12 hours in two pots from the dock behind his house. It was a great day at the art festival, and it was even better getting to spend time chatting with William about his beautiful artwork. His family gallery also offers guns, guitars and antiques. So, make it a point to stop by one Sunday or visit their historic gallery in Beaufort at 901 Bay Street. This Resort Girl might just need one of those antique piano keys! 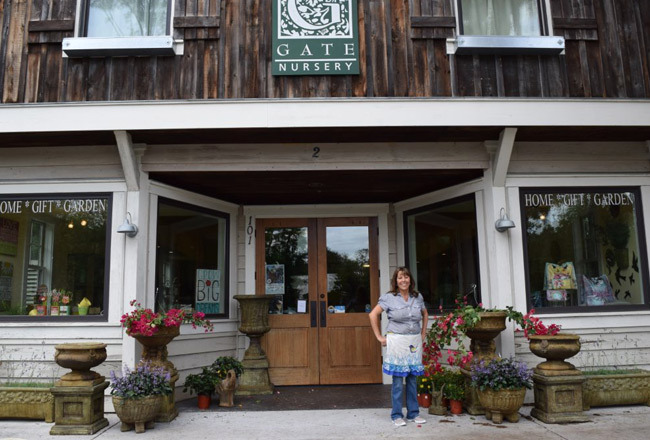 When you visit Bluffton, you must stop by Garden Gate Nursery. Located at 2 State of Mind Street, this quaint shop is one not to miss. Run by a Resort Girl Entrepreneur, Margie Fox, along with her family, it has everything on your tropical wish list. I have shopped there to buy plants, hospitality gifts and cute beach accent accessories. I recently stopped by to pick up a retro mermaid bottle opener to pop open my fizzy drinks. Margie was a retail executive for many years, but as like most of us Resort Girls, her calling brought her back to the water and her home town of Hilton Head, S.C.
To begin her journey into small business ownership, Margie bought into a small shop called the Garden Gate in nearby beautiful Beaufort, S.C. After some initial success, her family decided, like many small biz owners, to go full-time into fulfilling their dream. They built a really cool shop that is both a work/life environment on a picturesque corner in the popular Promenade center in historic Bluffton. What makes this shop so special is the mix of retail and garden items. 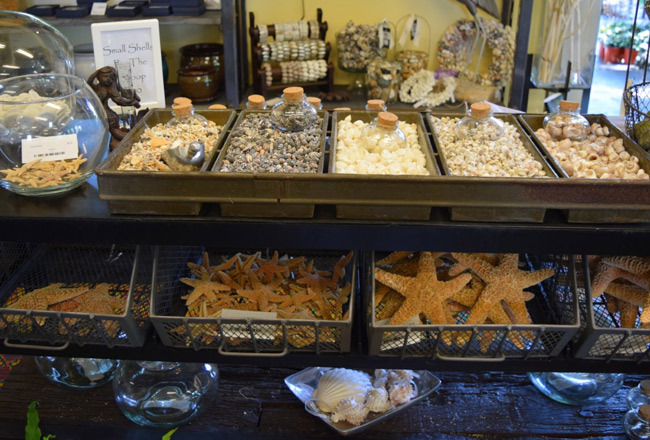 Locals stop by for tropical and zone-appropriate plants – while visitors come to explore the tropical accessories, beach décor, shells and other finds. 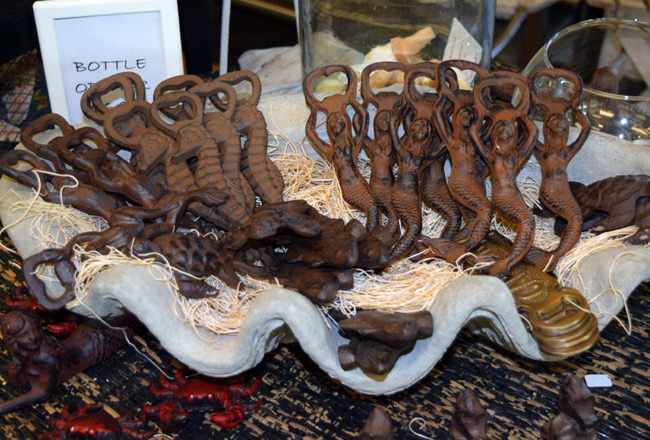 The “Shell Shop” will catch your eye if you desire to bring home a piece of the sea for your office or home. Bring some sea back to your home, and come see all the Garden Gate Nursery has to offer. Margie will welcome any and all questions on how to make your home reflect the Resort Girl State of Mind….